New York is amazing for sightseeing but we also did some shopping while I was there (it would be rude not too!). I did see the usual Zara and H&M but with limited space in my suitcase I reserved the room for brands that we cannot get in the UK, I’m going to make a statement that maybe won’t sit well with some people but I don’t really like the women’s clothes in the US, other than brands that we have at home, they just really aren’t for me. I had imagined Olivia Palermo fashionistas walking the streets but I didn’t see it, maybe because it was so frigging cold! Honestly I didn’t buy as much as I anticipated (I’m sure Chris is delighted), most things that I can get at home were much more expensive in New York and when the exchange rate isn’t in our favour that really doesn’t help either. In saying all this it didn’t stop me from heading to a few of my favourite shops! First stop Sephora, as we were staying in Time Square, where there was a huge Sephora and there is a beautiful older building which Sephora is in on 5th Avenue, the options are endless. Having been to the US a few times in the last 6 months, initially I went mad but this time I was very specific in what I was looking for. Thanks to the Anna Edit I had to try the It Cosmetics, your skin but better, a creamy full coverage with my favourite feature, a pump, to dispense the product. So far so good! Of course I bought it on the first day and couldn’t wait to try it on the second. It didn’t feel heavy but covered my pigmentation and give a glowy finish, something I’m not used to with full coverage foundations. While in Sephora I also picked up the Becca Highlighter. I haven’t really got on to highlighters, I spent a small fortune on the Anastia Beverley Hills contour and highlighter kits and although I love the powder and the cream contour, unfortunately I have yet to use the highlighter more than a few times. My highlight doubts changed after Simone said it was the holy grail of highlighters so I most certainly had to give it a whirl. I love the consistency of the product and have started to use it differently to other highlighters -if I’m not wearing much make up I will put it under my skin to fake a natural glow…it works a treat! The last thing I bought in Sephora was their face masks, I just love the dry skin mosturising face masks so I made sure I stocked up on them while I was away. Now I have my next few Sunday night facials sorted! I also picked up some Bumble&Bumble sea salt strap and a tangle teaser, silly me, I completely forgot to pack them but another one won’t hurt. With the weather being so cold outside and inside being so hot with heaters my skin has really felt the consequences. It has been so dry, flaky and altogether gross! While I was in Woodbury Common shopping outlet I called in to the Elizabeth Arden to get some 8 hour cream. At only $10 I bought two, for that price it was well worth it! 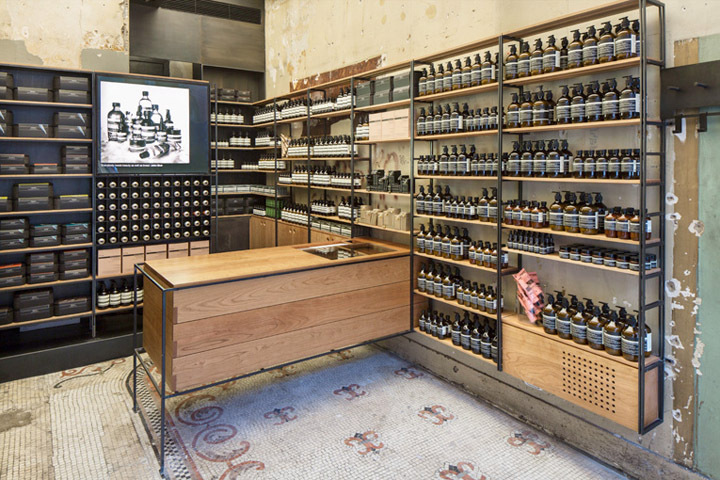 Last beauty stop, Aesop. This was a definite on my list as the last time I stopped by, the shop was closed for lunch and I was devastated. Someone had told me how amazing this brand of skincare was but with a higher price bracket, I didn’t mind, I had read such good reviews I had to give it a go. Plus seeing it around Rebecca from Roses & Rolltops house and it just looked so beautiful, it was the perfect edition to my bathroom, packaging really does mean a lot. We wandered up Madison Avenue and eventually we found it, a quaint store with no fuss, from the moment mum and I walked through the door we were in love before we had even said hello to the girl who helped us. The industrial walls with an old mismatched tiled floor, dark wooden shelves and black rails with an old sink, it was to die for. This was the first shop that I didn’t feel pressured to buy something. The girl asked what we were looking for and I told her about my very dry skin and she picked out a few items and tested them on my hands. No harsh chemicals or alcohols insight. I decided to get the Parsley Seed Facial Cleansing Oil and the Damascan Rose Facial Treatment. They left my skin feeling clean, soft and most importantly hydrated. Since I have started used the oil every couple of days for the last couple of weeks, I have seen a huge change in my skin with no flaking and it seems to be less inflamed. The last thing I bought was the mouth wash, an unnecessary purchase I know, but I just loved the bottle, it looks so medicinal, I doubt it will be used very much just because I really just like the look of it but maybe when I start using it, I may just love it. Not at all beauty related but I did make a stop in Antropologie *PLEASE COME TO BELFAST*. I easily could have decorated our home with the gorgeous items in store but I kept it to a minimum with very little room in my case, buying a gold initial mug and one of their candlefish candles, it’s official I’m a candle fiend! Anthropologie candles are without a doubt my favourite in terms of burning and smell, I think they burn so evenly throughout and the smell is divine around the house, I can easily smell it upstairs when it is burning in the living room (no offense Jo Malone or Diptyque, I still love you too!). I did spot a ‘Hello Lovely’ marble chopping board but it was easily 3 kilograms so it would definitely have put me over weight…I’ll maybe order it online now I’m home!